Continuing with my attempts to eat healthily I am trying to take packed lunches to work with me, and this salad is one of the things that I have been eating this week. I always find lunches quite difficult when I am at work; if I am hungry and in a hurry, it is just too easy to grab an unhealthy sandwich and a bag of crisps. Such a British habit!! My work colleagues cannot fathom why I like sandwiches so much. 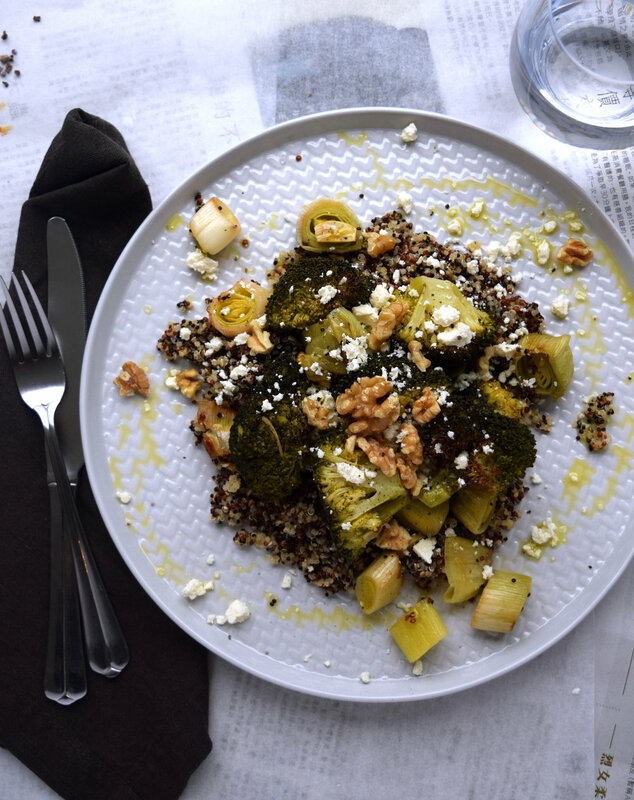 I love broccoli, it is probably my favourite vegetable, and I think the combination of the roasted broccoli, nutty quinoa and salty feta works really well in this salad. It is really nice served warm when freshly made, but it also keeps well in the fridge for a few days so I make enough for at least 2 days packed lunches at a time. A healthy and satisfying lunch. Preheat your oven to 180 degrees centigrade. Wash the broccoli and leeks, chop the broccoli into separate florets and slice the leeks into pieces approximately 2cm wide. Toss the broccoli, leeks, and garlic in 3 tbsp of the olive oil and place in an ovenproof dish. Season with salt and pepper and roast in the oven for 20 - 25 minutes until tender and starting to turn slightly golden at the edges. Whilst the vegetables are roasting prepare the quinoa. Place the washed quinoa in a pan with the vegetable stock and simmer for 15 - 20 minutes, or until all the all the liquid is absorbed. Fluff up with a fork to separate the grains. Serve the quinoa topped with the roasted vegetables and drizzle with the remaining olive oil. Top with crumbled feta and the walnuts. So simple but very tasty. * I don't give metric measurements for quinoa because I always measure it using cups. As a general rule, you need 2 measures of liquid for 1 measure of quinoa. It doesn't matter what cup you use, it doesn't need to be a measuring cup, just ensure that you stick to that ratio.